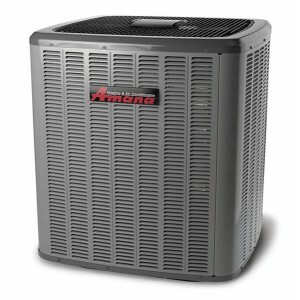 The Amana ANZ14 Heat Pump is a 15 Seer Heat Pump that will provide energy-efficient performance with the reliability of an Amana brand product for years to come. The energy-efficient performance and reliability of an Amana ANZ14 Heat Pump will validate your purchase decision with dependable indoor comfort. Buying the Amana brand means you can be confident today that you made the right long term decision. Quiet Condenser Fan Motor – High-efficiency, single-speed motor with special three-blade fan design provides dependable, quiet airflow across condensing coil. Efficient Cooling Capacity – Refrigerationgrade premium copper tubing and aluminum fin condenser coil configuration deliver outstanding heat transfer properties with R-410A refrigerant. SmartShift™ Technology – Time-delay defrost technology allows for a reliable, quiet and smooth transition when units enter defrost mode. Heavy-Gauge Steel Cabinet – Durable finish resists corrosion and protects essential components. Factory-Installed heater Band and Suction Line Accumulator – Ensures refrigerant is ready even in extreme external temperatures.